It has been almost a year since I completed the main story for Final Fantasy XV on PS4. My overall impressions of the game were positive. I enjoyed the characters, the world, the design, the gameplay, and so many other aspects. The pacing is a bit off toward the end of the game (I would have prefered a lighter story that let you take in the world without a sense of impending doom). I also found the game to be a bit of a slog at times technically with some load times taking several minutes or with the frame rate being around thirty frames and lower. Since I have played a larger amount of games on PC lately, I could not wait for Final Fantasy XV to be released on a more powerful and customizable platform. Now that we are a week out from the official release and have access to the first chapter via the Window’s Edition demo, I am still extremely excited to replay the game, but there are a couple problems that I hope will not ruin the experience. I finished the demo and found that I had surprisingly spent two plus hours completing chapter 1, exploring the world, and completing side hunts. I was not expecting the demo to last this long or to include as much as it did. It was a lot of fun and brought back fond memories of playing these missions for the first time. Everything feels like it holds up and these feelings are only heightened by playing with a higher resolution and frame rate. The game feels smooth and fluid unlike the weaker console version. Add to this the inclusion of a first person mode and graphical upgrades as well as the additional pieces of content that will be included with the full release, and you have possibly the best way to play Final Fantasy XV. Unfortunately, I am afraid to go any stronger than possibly. My experience on PC has been very smooth, but I have encountered a few problems with the demo. Some are problems with the interface not being catered to a keyboard and mouse while others are glitches that I came across. Let me begin with the interface and menus. When you scroll through quests or look at your map, you do not have full control over where your cursor moves like you do in other PC games that utilize the mouse. Now that I am playing more games on PC, I found myself somewhat annoyed by not being able to move the map around with my mouse. I would move my mouse to look around the map, but it would only cycle through the different quests or options on the side of the map. You can move around the map using the I, J, K, and L keys (which seem to function as a right analog stick on a controller), but it is extremely awkward to reposition one of your hands to these keys. The keys that control moving the map can be rebound, but you can not bind the movement of the mouse to this function. It’s a great map, but I would prefer having a bit more control over it. Other games such as Metal Gear Solid V and The Witcher 3 allow you to move around the map by moving the mouse. It isn’t entirely necessary to have complete control over maneuvering the map or options with a mouse, but it is going to be hard for dedicated PC players to use a seemingly archaic way of interacting this way. I believe that the mouse is one of the best interfaces that can be used in gaming. Not being able to fully utilize it can be irritating at times. To mention some positive features about the controls on PC, all buttons can be remapped. This was one of the major features that I wanted for this version of the game as so many actions share the same button on console. This is also the case on PC oddly enough; so remapping a majority of the buttons is almost necessary. Here are just a few controls that can be customized. I found myself trying to interact with something on console only to jump into the air multiple times. Thankfully the jump button and the interact button are now isolated, and, if they weren’t, I could make sure that they would be isolated by adjusting their keybindings in the menu. The default controls are a bit odd on PC with left click and “E” sharing the functions of a “hold to sprint” type control, “interact”, and “attack”. There are other controls that I think could have been utilized better on PC such as the assigning attacks for the other companions feature sharing controls with your WASD buttons plus holding the left control key. Some of these actions aren’t really intuitive enough and feel more like they are trying to copy the functionality of a controller rather than taking advantage of the more superior keyboard and its many available keys. Overall, I find the controls on PC to be very good, but it does feel like it is held back by being based off of functions intended for a more limited controller. Maybe upon reassigning keys the game will feel even better on PC. A feature that I spent some time trying out is the first person mode. I made a video showing my time using the function a few days ago. This is definitely a great addition to the game as it allows for more immersion. The problem with this, though, is that it is either impractical to use in most situations or just isn’t allowed to be used in others. Get down from there, Ignis. I am considering making a separate discussion on the first person mode as I want to go into further detail as well as test it more, but I found that when I would interact with objects or do other gameplay functions, it would force me back to third person for a second or so before throwing me back into first person. It would be very jarring at times. ...then back to 1st person as I get back up. It is also a dumb idea to fight in first person because of the possibility of being attacked from behind. You can only see who is directly in front of you unlike in third person where you can see the majority of the battlefield. There is also no field of view slider to adjust how much of the world you can see. The view feels a bit narrow especially when you feel like you are buried into the body of larger beasts that you fight. Fighting in 1st person is a little disorienting. I am glad that a first person mode was included, but I would have preferred a “hide HUD” control. There is not a dedicated button to hide the HUD, but there is a button to switch between first and third person. Hopefully a button to hide the HUD can be patched in at a later date as well as an FOV slider. The game looks even better without the HUD. It can be turned off, but only by accessing the settings. I also want to mention that the game looks great on PC. I feel that the game will probably look even better as you progress through the world. A lot of the early game environments are rooted in reality and do not have as many vibrant colors or interesting features as some of the later game areas do or how other games such as The Witcher 3 feature color in all aspects of the game. I am eager to get to Duscae and the other areas of the game to see how the rest of the world looks in comparison. So far the game looks great, but I am sure that the desert will pale in comparison to the larger towns and forested areas that are also in the game. Thankfully Final Fantasy XV also features tons of customization options when it comes to graphics and audio settings. There are plenty of sliders which will, in theory, help you have the best experience possible for whichever components that your PC is using. Before I wrap up this discussion, I want to mention that I had some minor glitches as well as a more serious one. The minor ones were just problems such as characters appearing out of thin air during an in-engine cutscene and the interact button not always working on the first or second attempts at hitting the button prompt. The more serious problem that I had with the demo was when I went to take a picture at The Crow’s Nest. Noctis began to sit down beside the bird mascot, but started to enact a falling animation. Noctis continued to fall in place during the picture, and he continued to do this after the picture was taken as well. Unfortunately the game’s pause feature just shows the word “Pause” during some parts of the game rather than the full menu for some reason and did so here as well. I was unable to reload the game because of this. I had to force quit the game and reload a checkpoint. Thankfully the game had autosaved fairly close to where I was. Look at the detail on the boots. Bugs are always a worrying sign in gaming, but there are always some problems in newly released titles. This is why I can overlook them most of the time. However, I was disappointed by the fact that the game does not always let you access the menu. This would also happen during other moments in the game as well as in cutscenes. This may be a gameplay mechanic or residual controls that focused on the limitations of a controller or console. Either way, I feel that being able to access the main menu should be in the game at all times. I understand it possibly not being available during a cutscene, but it should be there during all times because of bugs and other problems. If I could access my saves, then I could have reloaded the game and continued on. But, instead, I was forced to quit the entire game. I am not too upset over this as it was a smaller bug that I only encountered once, and I was able to complete the action the second time without falling (although he did start to fall as I interacted with the spot the second time). However, I hope that the developers will at least consider adding in access to the main menu if more bugs are expected to be encountered. But, aside from the potential for more bugs to spring up, I think that Final Fantasy XV is in a great place on PC. It isn’t quite where it needs to be (which is a bit disconcerting), but Square Enix should be continuing to support the game past launch which should take care of any technical issues (unlike XIII-2 on PC which still has game breaking bugs). 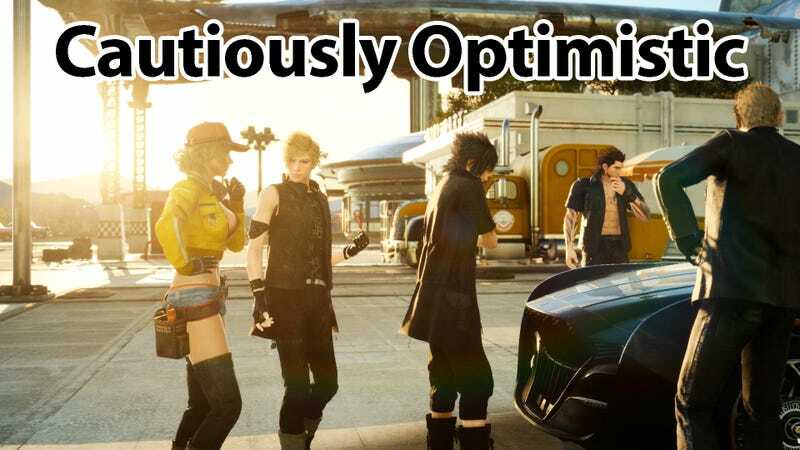 The developers have put a lot of time into making XV work, but I feel that more time may need to be spent on including more functionality that PC gamers have grown accustomed to as well as checking for additional bugs. I would like to have full control over the map as well as other features such as being able to access the menu at any given time or being able to toggle the HUD on and off with a button press like you can in The Witcher games. At the end of the day, these are minor complaints that do not have a large impact on the overall gameplay or story, but having these features will ensure that a larger audience of PC gamers who are used to more technically in depth experiences are being catered to.